You now have more options than ever when looking for the perfect DermaQuest peel for your specific needs. Our new peels are now available in all clinics. The five new peels are: SkinBrite, Peptide, DermaClear, Stem Cell, and Vitamin C. Read more about each each of the peels and the concerns they can treat below. Skin discolouration is one of the most common complaints for which people seek treatment. The varying differences in skin pigmentation can be a result from sun damage, pregnancy, or age. The new SkinBrite Pigmentation Peel was created to help ease this problem. It is based on triggering the skin’s natural renewal process, exfoliating deep into the skin, encouraging damaged skin cells to shed and allowing new brighter, lighter skin to come to the surface. While skin will show benefits from one session, a course of treatments over the long term is recommended to get the best results. The procedure takes approximately 45 minutes and recommended downtime is just a few days for optimal recovery. This powerful peptide resurfacer has shown its ability to increase skin’s firmness and provide lift. It can lift lines and reduce the depth of wrinkles, allowing for a smoother complexion. The Peptide Peel is designed for advanced wrinkle correction and is serious about providing anti-ageing benefits. It works by promoting collagen production and elastin synthesis, to result in smoother and firmer skin. Peptides have long been shown to provide anti-ageing benefits and are a very popular “go to” solution for helping skin look more youthful. Acne is a fact of life that many teens have to deal with; however, adult acne is becoming more prevalent as well. Many believe that our highly stressful society has led to the fact that 45 percent of adult women and 30 percent of adult men now suffer from acne. A DermaClear Acne Peel serves to re-balance the skin’s oils, thereby helping clear blemishes and prevent further acne outbreaks. 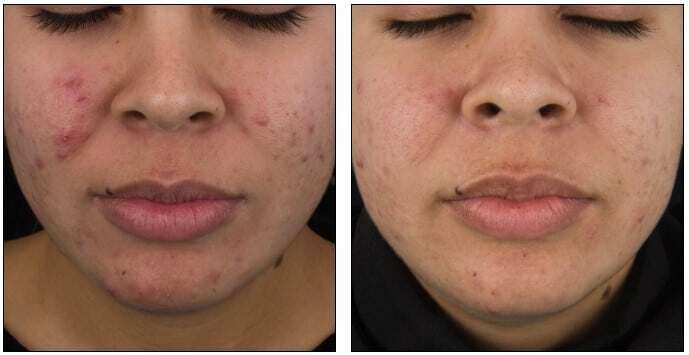 This particular peel uses the popular Alpha and Beta Hydroxy acids to reduce the bacteria that can cause acne, as well as treat and heal blemishes that do occur. It is a powerful treatment that through consistent use, can provide fresher, smoother skin with a clearer complexion. A relaxing and soothing treatment, this glycolic and retinol combination is applied to promote a more youthful appearance. The Stem Cell Anti-Ageing Peel was created for those who desire a more youthful appearance but don’t want to go through the cosmetic surgery, laser treatments, or anti-ageing injections. The process begins with a skin cleansing process, application of the concentrated solution, followed by a rinse, and application of a masque composed of enriched enzymes. This special attention is designed to rejuvenate your skin, resulting in a more youthful complexion. If your skin is feeling tired and dry, the C Infusion Peel is the perfect way to wake it up! Vitamin C is useful for so many purposes that it should come as no surprise that a peel enriched with this popular vitamin could promote a healthier and more vibrant appearance. Studies suggest that application of Vitamin C directly on the skin, as opposed to taking Vitamin C supplements orally, works 20 times better. Vitamin C has proven very effective in rejuvenating skin cells through enhancement of collagen synthesis. It is also a known deterrent to free radical cell damage. Not only does the C Infusion Peel pay specific attention to the surface of the skin, but it aids also by penetrating the deeper skin levels to remove debris from pores. The C Infusion Peel stimulates a natural renewal reaction from your skin’s cells and is especially for those with sensitive skin, skin damaged from the environment, dry and/or mature skin, and skin that is rosacea-prone. Any one of these five peels can aid the return of youthful, glowing, and radiant skin. When your skin looks great and you feel great! So, book your free skin consultation now to start your journey to clear smooth skin!